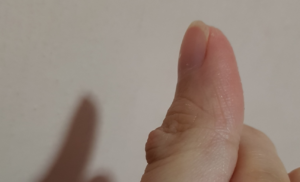 What could be the cause of a hard bump on my left thumb joint? Thank you for the email. From the picture, this does look like a digital myxoid cyst. This usually occurs over the distal finger joints and may be associated with underlying osteoarthritis. The cyst may have a connection with the underlying joint. Some simple treatments includes rubbing and pressure over the area and freezing it with liquid nitrogen treatment, but the recurrent rates are high. Definitive treatment is through surgical excision of the lump. 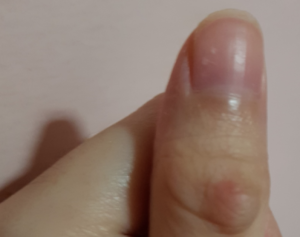 There are other conditions that can mimick this such as epidermoid cyst or giant cell tumour of the tendon sheath, so if doubt, do visit your doctor to get the diagnosis confirmed.